I just bought a 2016 impala it did not have home link so i purchased a overhead console on line. After removing the original over head console i thought i would find a harness for the home link but i cant find it anywhere. my question is it there and i just didnt look hard enough? Did anyone happen to reply to your questiom\n? I am trying to do the same modification in my 2018 Impala, but I do not see the Homelink wiring connector up under the overhead console? 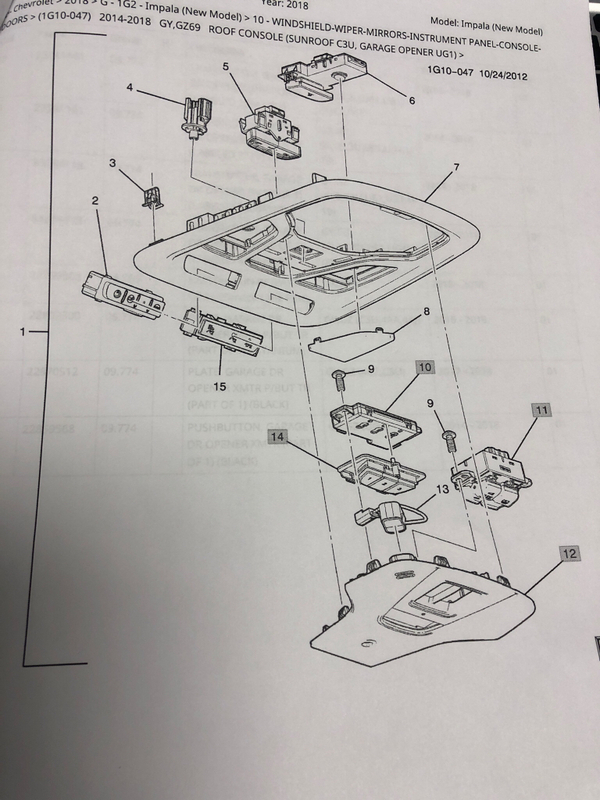 A little update: I went to my local GM parts wholesaler and got an exploded view parts diagram of the overhead console with sunroof and Homelink. I got part numbers for the transmitter (84044118), the buttons (22859568), and the faceplate (22802300 Titanium color). Before I order the parts, I opened up the console to see if the transmitter wiring connector was already there, but I could not find it. My question is there a wiring pigtail I need, or is the entire wire harness different for the Homelink option? Hi, Finally I found a place where I can also share my thoughts with you guys. I have bought a new car and I am thinking to tint the windows of my car, but I don't have that much knowledge about the window tinting in atlanta, Can any suggest me which professional should I hire? I can confirm that if your car did not come with a dimming mirror, or Homelink/sunroof buttons, the harness connectors are likely NOT THERE. I was installing an OEM boneyard dimming mirror. I have pinned and tested ALL the wires in the overhead for a reverse /backup line (mirror disable) and it’s just not there in my 2018 LT/V6. I have been inside boneyard impalas that DO have the dimming mirror, but the tail/connector is missing on my harness where it should be. I could not find accessory switched 12v power in my console, only continuous 12v, Lamp power, or 5v switched. I had to get a "fuse tap" from Autozone and come out of accessory switched fuse #6 , run a wire up the front pillar, and across the headliner to get to my mirror. Also had to dig out a Green w/white stripe Rev camera feed at the drivers side floor (1 of 3 same color) for mirror disable. What a PITA. Apparently there are "steps" in the option codes that dictate different harnesses. ie: If one of say three particular options is to be installed at the factory, then a standard harness that supports all three is installed. Somehow they save money omitting those few connectors and copper, yet it must cost money to manufacture and keep multiple versions of harness on hand. Here are the 4 different roof harnesses for my impala. Looking at a picture of them, they COULD connect to a master connector somewhere at the pillar heading down to the main block. This would mean pulling the headliner to install this harness IF it works like that. I don’t know. This site is actually run by a brick/mortar dealer in Ohio, where I get my parts and pick them up without shipping costs. 😊 You can find the picture of the harness here. That said, I cant imagine the homelink option needs anything other than accessory power, maybe even unswitched power? Regarding my previous post.. My impala is a 2018 that I added the dimming mirror to. Hey did you ever figure this out? I have a 2016 2LT and looking to do the exact same thing! !